1) I’m speaking as a representative of the Forest Hill Society, and with the backing of the Tewkesbury Lodge Estate Residents’ Association, the Sydenham Society and Save the Face of Forest Hill Pools. I’m happy that we’ve been able to find a common view on the latest proposals from the Council. 2) Thank you for a report that provides some new ideas. 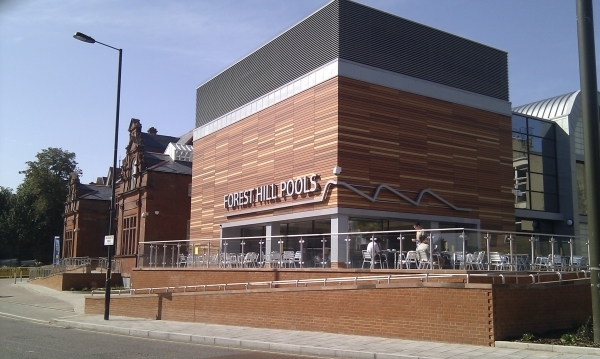 We are really glad you have restated that you want a pool in Forest Hill – we REALLY want one too! We want a pool IN Forest Hill. Forest Hill Town Centre feels as if it is dying as a result of the closure of the pool three years ago. The report says that Option 3 could give us a pool sooner, but we would lose of one of the town centre’s key ‘anchors’ as identified in the 2003 Urban Development Framework. We have to find a way around this problem. Rushing ahead with newly conceived option three cannot be right. If you consult with such a strong preference for Option three without fully exploring the alternatives we fear there will be another fiasco. 3) We very strongly support option 2, but not as a pipe-dream for 2015. We must work together to find a way of delivering this now. Option 2 has many benefits, including good design, retention of ‘civic’ use and the pools frontage. It would revitalise the town centre and protect employment. It has minimal impact on neighbours. Our online survey and other feedback shows that it is supported by the overwhelming majority of residents. We believe that this option not only has the support of the majority of Forest Hill residents but also Council Members and Officers. It has the support of the swimming lobby and the Heritage lobby. We can’t shelve this option for three years. Nobody can accept that a solution that was first presented to the stakeholders just 3 weeks ago can’t be delivered before 2015. The location of the pools is really important. 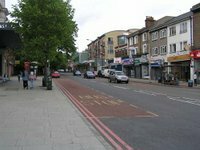 Willow Way is 600 metres further from the centre of Forest Hill and is in Sydenham. Its catchment area overlaps The Bridge and Crystal Palace but is further from Honor Oak, Perry Vale and East Dulwich, which have no modern swimming facilities. Less people in Lewisham would be within a kilometre of a swimming pool if you move the site to Willow Way. We are concerned that a pool in Willow Way would be hidden in a back street and further from a wide range of public transport. This location will not attract custom or support long term viability. Lewisham’s leisure strategy and national guidelines recognise the importance of town centre locations for the provision of leisure and we are lucky to have a great site on Dartmouth Road! 4) We understand the constraints of planning policy and the important principle of not losing employment land from the Borough. As presented, option 2 and option 3 create exactly the same number of jobs from the pools. There would be NO NET loss of employment under option 2, and possibly an increase, if Willow Way included live work, or commercial and residential uses. On the other hand, option 3 would seriously threaten jobs in the town centre as a result of relocation of the pool. This cannot be the intention – it does not make sense to quote planning policy against Option 2 when it would actually increase employment opportunities within the borough. The issue needs further consideration and thought so that Willow Way can be used to cross subsidise the proposals. 5) We are concerned that the planning constraints of option 3 on Willow Way have been understated. Gaining planning approval for a significant leisure use outside of a defined town centre is contrary to both Lewisham Council Policy and national planning policy statement 6 on Town Centres. At the same time, putting high density housing on the Pools site would materially affect the setting of 2 listed buildings. We haven’t had the privilege of seeing the planning advice received on the proposals but know that Planning isn’t usually such a black and white issue as has been presented. 6) We are also concerned that the problems of delivering housing on the Pools site have been grossly understated. Delivering 60 flats on an existing leisure site in the current economic downturn and against public opposition will be difficult. It must be easier to construct a robust and sensible argument for the delivery of a mixed use development on Willow Way and a New Pool on an existing leisure site in the Town Centre. Option 2 only requires an increased range of uses on one site whilst option 3 needs a change of use on both. Some employment on Willow Way and a new leisure facility on Dartmouth Road will regenerate the Town Centre. The benefits significantly outweigh the case for leisure employment only on Willow Way, more empty shops on Dartmouth Road and high risk, high density housing. 7) Option 3, as the only recommendation to be delivered in the short term in this report, is the wrong one. Issues are not being considered in the round and it is not yet quite the right time for another consultation. Both Option 2 in 2015 and option 3 in 2011 would kill the town centre at a time of great opportunity with the coming of the East London Line. Pursuing Option 3 raises significant issues including, without being melodramatic, the future of Forest Hill as a Town Centre. 8) When it is right time to consult please make sure that the consultation asks open, informative and useful questions. The answers will then be useful if something unforeseen happens. We need a consultation that provides useful information about what people want from the pools project, in addition to a response on specific options, if that is what you think you need. We don’t need a tick box form for the 2 ‘closed’ options. We want a much more participatory approach involving stakeholders and residents. We don’t need another closed consultation with stakeholders kept in the dark. Let’s work together on this to deliver a first class leisure facility on the Pools site as soon as we can. 9) We understand that there is a proposal being developed for an arts centre in Louise House and would like your support for it, at the very least by financially supporting a feasibility study. We need the creative and youth oriented activities in Forest Hill that this proposal could bring. 10) Please consider what the Community has said and find a way to make option 2 a reality in the short term. This is what the Community wants and this is what your Officers recognise is the best option. Waiting until 2012 to revisit the options is not acceptable. We have already waited three years.